In today’s hurly-burly work environment, many businesspeople find it challenging to avoid distraction, stay focused, use their time and energy to maximum benefit, and gain ground on important goals and outcomes. One study by the Families and Work Institute found that one third of Americans are overworked and more than 50 percent of those surveyed say they are either doing too many tasks at the same time or are frequently interrupted during the workday - or both. In short, we are overloaded! Time Management In An Instant helps the reader overcome this feeling of overload and avoid the traps that lead to an unproductive relationship with time. 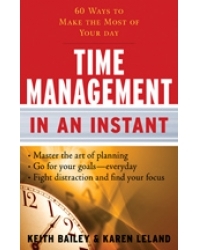 It offers field-tested time habits and expert advice based on the latest research that will help the reader better manage, create, and spend their time with more satisfaction and results. • Harnessing the power of completion. • Linking your core values to key projects. • Finding the power of mini-tasks. • Playing the 80/20 game of accomplishment. • Getting a procrastination inoculation. The In An Instant series is a new brand of user-friendly, engaging, and practical reference guides on core business topics, which capitalizes on the authors’ extensive experience and knowledge, as well as interviews they have conducted with leading business experts. Written in an upbeat and engaging style, the series presents 60 tips and techniques with anecdotes, examples, and exercises that the reader can immediately apply to make their work life more efficient, effective, and satisfying. Karen Leland is a partner in Sterling Consulting Group and coauthor with Keith Bailey of the best-selling Customer Service for Dummies and Watercooler Wisdom: How Smart People Prosper in the Face of Conflict, Pressure and Change. Her consulting clients include American Express, Roche, Marriott Hotels, and Oracle. She is a familiar face in the media and has been interviewed by Time, Newsweek, Ladies Home Journal, Women’s Day, CBS, and Oprah. She lives in San Rafael, California. Keith Bailey is a partner in Sterling Consulting Group. His consulting clients include Microsoft, AT&T, Johnson and Johnson, and Lufthansa. He has been interviewed by Fortune, Entrepreneur, Inc. magazine, and CNN. He lives in Mill Valley, California.